It was National Chocolate Cake Day on Friday and the Church of England celebrated it by issuing a fudge of a report on LGBTI acceptance in the Anglican Church. The 15-page report published today called for “a fresh tone and culture of welcome and support for lesbian and gay people” – well, so long as you are celibate and don’t want to get married. 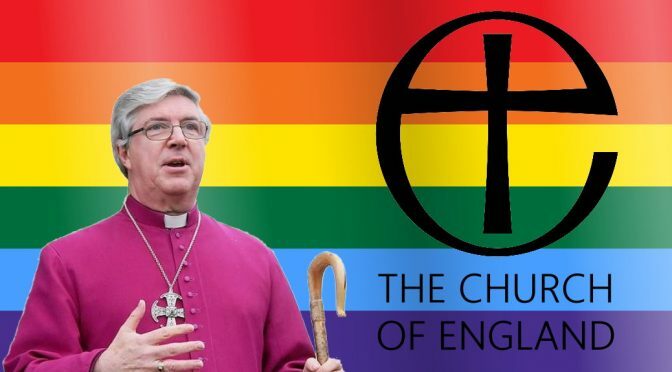 Bishop Graham James of Norwich led the CofE report into LGBTI people in the Church and concluded that there should be no change, some repentance, maximum freedom within existing prejudice – I mean doctrine, and called for more reports to conclude that there should be no future change either. Okay, that last bit was me being cynical and pessimistic, but whilst history has seen the addition and change of women in not only leadership but the episcopacy, I find it hard to imagine ecclesiastical change on the position of gay and lesbian Christians any time soon, not to mention the very binary gendered position on marriage when even the Bible acknowledges the existence of people outside of binary male and female. I was defriended by evangelical Christian friends and told by my Prayer Book church that it was easier for them to believe that I’d committed adultery (I hadn’t) than for them to understand my being transgender. Upon being asked to leave, and I used to deliver sermons there during an interregnum, I was offered the sickly salve of “I can put you in touch with more affirming churches”. The current of society is flowing forward faster than the Church can even tread water mid-stream. As a result, it is like dead wood somehow anchored and stuck by a pseudo-theological/traditional snag whilst open-minded thinkers float on by. If the truth will set us free, then the Church needs to wake up to the risk of its own demise, ageing population and irrelevance to this generation. I was once a young person in a church, going on to become a missionary and theologian until my identity was rejected by the Church. It seems the Church is not interested in the truth of authenticity, something that has truly set me free. The bishop and the report also used language such as “culture of our times” and “lifestyle” questions, inadvertently suggesting that LGBT lives were temporary cultural lifestyle choices that would perhaps go out of fashion whilst the Church’s doctrine remained written in stone, essentially. Any student of ecclesiology and patristics well knows how Christian theology and church practice have been hammered out at councils, and been at the whim of political and personal beliefs of the time. Not to mention, the dubious concept of biblical marriage given how many types of marriage there were in the Bible, only one of which is between “one man and one woman”. Two women or hundreds more were also options, as were sisters, slaves, prostitutes, and eunuchs. Sexual relations often began before marriage – even defined it, sometimes. It was concluded that there was no double standard in denying gay clergy active sexual relationships and yet allowing homosexual lay people to express their love physically since canonical law demanded “an exemplary position of the clergy”. Yet, the double standard is that the same celibacy is not required of heterosexual clergy except in the Roman Catholic Church. So, going forward, heterosexual clergy may be asked similar questions or homosexual clergy not asked and “trusted”, so as to bring in an equality of ordinand interrogation. Bishop James said this is “Not Don’t Ask, Don’t Tell in any shape or form.” Sounds like it to me and the Lesbian and Gay Christian Movement and Changing Attitude open letter today now terms it “official policy”. Whilst canonical interpretations were described as “a latitude with boundaries” it seems the Church has butted up against those boundaries and finds little room for present or future movement. Whilst Bishop James says it’s not the “last word on this subject”, it sounds like it is the last nail in the coffin for LGCM & Changing Attitude members who are “not prepared any longer to wait for the bishops to act collectively in this matter”. Their grace and patience have been stretched too far. Whether it’s the Issues in Human Sexuality (1991), Pilling Report (2013) or the current statement (2017) it seems the Church of England is firmly rooted in the Christian tradition – of the past. Sadly, that is the way the report is most likely to be heard by LGBTI Christians and LGBT-affirming society as a whole. Bishop James said this was not the end of the process but left the Church “somewhere in the middle”. I think that is a typo for “muddle”.